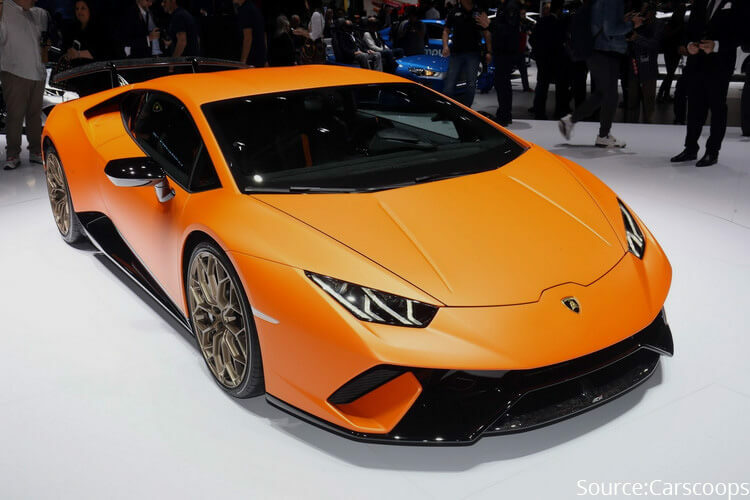 After the success of the previous Lamborghini “Hurricane” Members, the Lamborghini unleashes the latest beast of Huracán Family: Lamborghini Huracán Performante. Of course, it would such a waste if we miss it, so, let’s check out this new member and see whether it can keep up with our expectation. Just like its name Huracán (which means Hurricane) and its previous brothers, Lamborghini Huracán Performante keeps focusing on the lightweight and the aerodynamic. The Lamborghini Huracán Performante has proved itself to be a prominent rival to other opponents with its debut at Nurburgring Lap. This Lamborghini finished the lap within 6 mins 52 secs and bested the Porsche 918 which completed the lap in more than 5 seconds. Now, with its official showcase in Geneva Motor Show 2017, we’re able to see more of the Huracán Performante. Lamborghini Huracán Performante possesses the 5.2-litre aspirated V-10, but with the stronger power. This more powerful aspirated V-10 allows this beast to produce 602 horsepower, and 413 lb-ft of torque. By estimation, it only takes 2.9 seconds for the Huracán Performante to reach from 0 to 100 km/h, and 8.9 seconds to reach to 200 km/h. 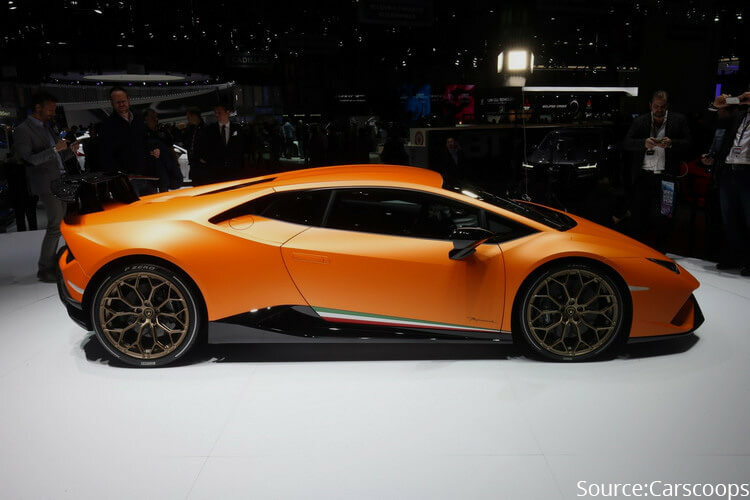 Though it is true that there are other rivals with the power on par with Huracán Performante such as Audi’s R8 V10 Plus, what makes this Huracán model special comes from its upgraded aerodynamic which is called as Aerodynamica Lamborghini Attiva (ALA). This special feature allows flaps and wings to adjust to be able to shape the air-flow in all kinds of situation. This upgraded ALA uses fast-reacting, electronic control system to quickly adjust this Huracan model’s flaps. In the snout, a small flap was built in to reduce the downforce and drag-force. Furthermore, the truly fascinating aspect of this new ALA system comes from its wing which can channel the air flow, allowing the aero vectoring for Huracán Performante while cornering at high speed. This means both right flap and left flap can adjust (in only 0.2 seconds), for example, the left flap will close when turning left, while the right flap opens. 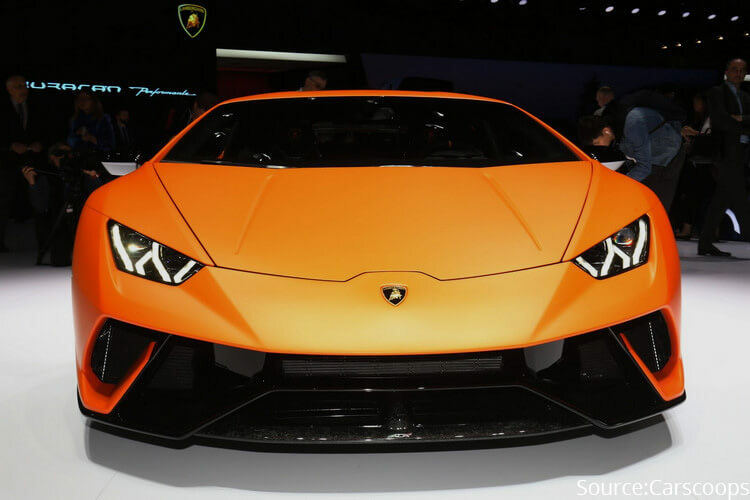 This allows the Lamborghini to put the downforce to the left, providing the ability for the right wheel to turn. 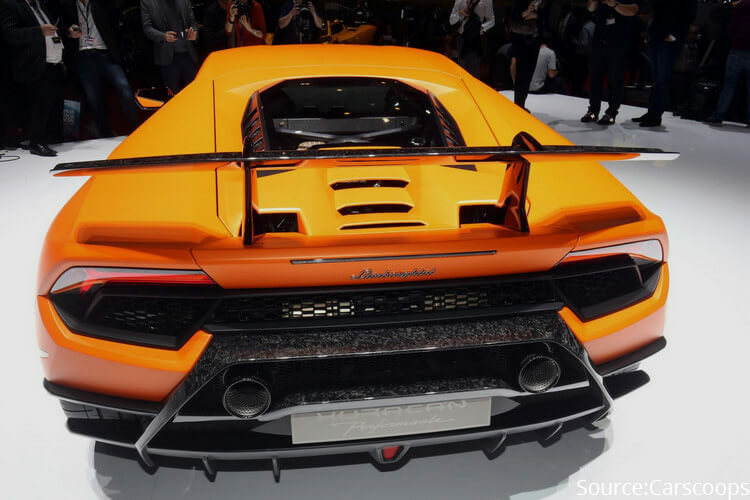 It is estimated by the Lamborghini that this Huracán model’s rear wing can bring up to 750% more vertical downforce than previous Huracán predecessor. With such an aerodynamic system, no wonder why the Lamborghini Huracán Performante can finish the ring in 6 mins 52 secs. When it comes to lightweight sports cars, optimizing the car’s overall weight is necessary. 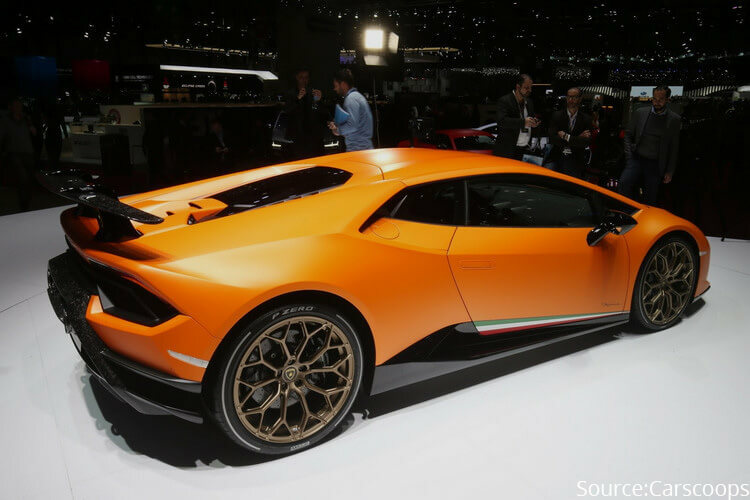 In this case, the Lamborghini has reduced the Huracán Performante’s by 40 kg by using the lightweight carbon-fibre and aluminum materials for its build (or Forged Composites according to the Lamborghini). Combining with the ALA system, this delivers the best performance for weight reduction and downforce manipulation. There are other significant changes, for example, the Haldex all-wheel driving system which is fully electronic controlled, allowing better speed, precision, and grip. Another typical example is the special Pirelli P Zero Corsa tyres built for both activated and deactivated aerodynamic system, track and road scenarios. 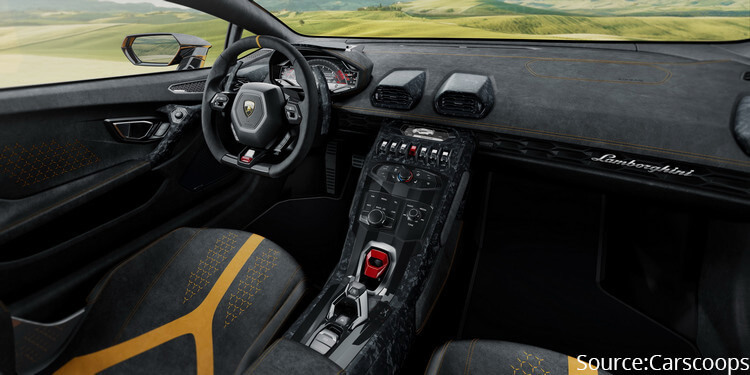 Similar to the Exterior, the Huracán Performante’s Interior also emphasizes the heavy use of Carbon Composites and Alcantara, resulting in the considerable lower weight. The seatings also forged from the carbon-fiber, combined with other interiors design, all increase the model’s overall performance. The display uses the digital panel graphics, which provides full information on the aerodynamic system and other performances with its three modes. Of course, for custom interior design, we can contact the Lamborghini or the Lamborghini Ad Personam Program to adjust the appearance to our likings. 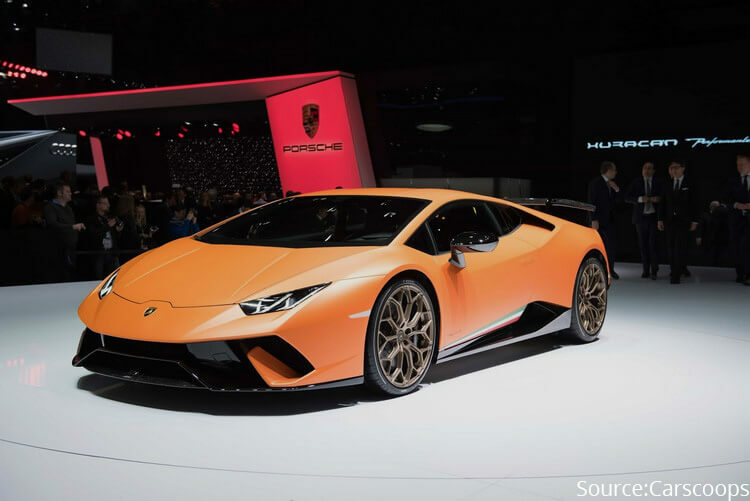 The Lamborghini Huracán Performante is expected to be on sale later this year in some international markets such as Europe, England, United States, Japan, and China. The price will be around 274,390 USD.